Noble Group is one of the stock that is most popular among our Singapore investors, I guess most investor is interested in this stock because there is always alot of news, rumours and action in the stocks. 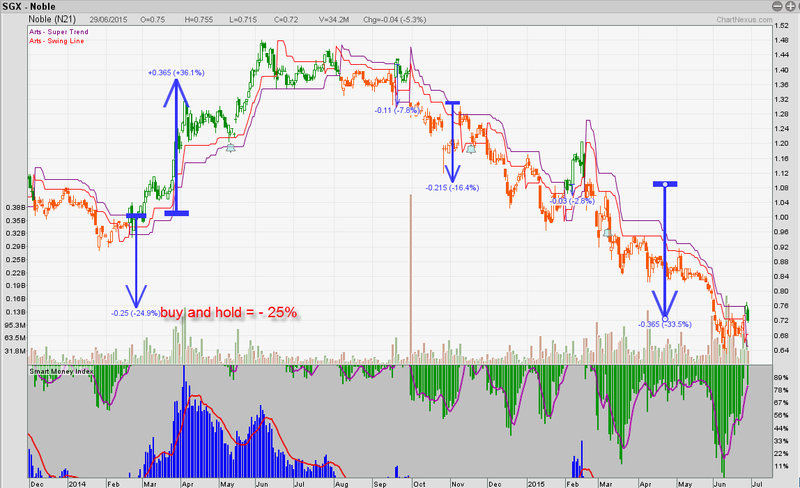 Since beginning of 2014 till now, the stock move from $0.95 Jan 2014, to $1.48 in Jun 2014, then it start falling all the way till today $0.72. Of cause we are not here to debate whether this is a good stock or not. But if you think this stock is good, you may be interested to know how you should have traded it. Our Supertrend system is a trend following system, the purpose of having a system is to prevent you from big loss in a stock and encourage you to hold for a big win. That is better than if you buy Noble and hold it until now, -25%, you probably lost 25% of you capital already. **To prevent losses, you should stay away from a downtrend when Supertrend candle show orange candle. **We cannot predict where the price will go, most people did not expect Noble to drop so much. Will Noble rebound from here? We cannot predict this. But system show green candle, anything is possible. **above gain and loss example are derive from Chartnexus gain and loss ruler, dont have time to calculate in excel for exact figures. ** For the same stocks no matter the stock is good or bad, there are always Winner and Losers. For more information on the Supertrend system and Stock example, please register for our next seminar in the link below. Like our fanpage for more updates!